These tote bags are ideal for both dye sublimation and our Digital (coated) Heat Transfers! This polyester tote bag can be printed with sublimation inks, digital transfers, screen printing, etc. 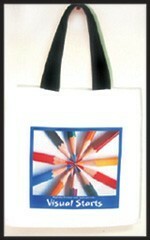 Bright White Polyester Tote Bag with 1" Wide Black Nylon Carry Straps: Polyester Fabric (8oz). 14"x14" (size may vary slightly) Envelope construction. This is a high quality bag! 1 or more $5.55 ea. 50 or more $5.42 ea. 100 or more $5.19 ea. 500 or more $5.05 ea. 1000 or more $4.89 ea.